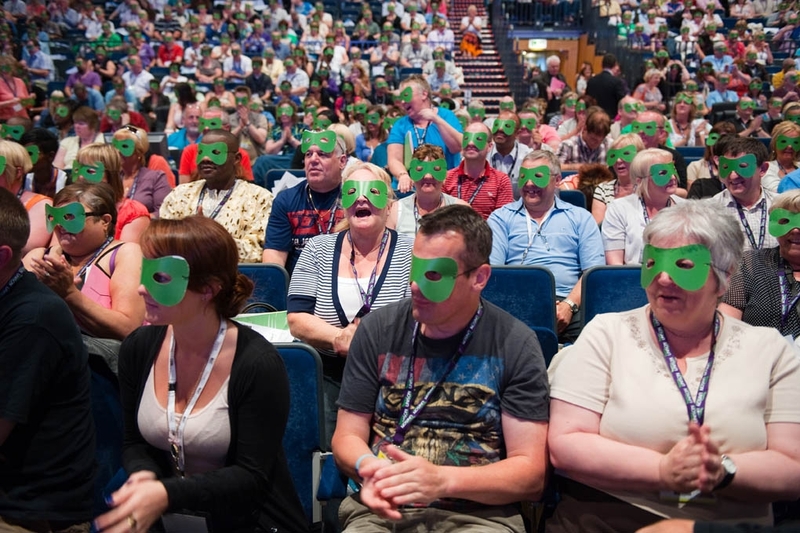 It’s not often you get to see thousands of people sat in a conference hall wearing green highwayman style masks, but that was what happened in 2010 when Billy Bragg spoke to UNISON’s National Conference. He came to talk about proposals for a ‘Robin Hood’ tax, a financial transactions tax levied on banks and City firms. He even managed to get conference signing the theme from the old TV series. It is estimated that a global tax of less than 1% on such transactions as currency trading, and the selling of stocks and shares and derivative products, could raise £250bn a year internationally. This money could be used to protect and promote public services, combat poverty at home and abroad, and tackle climate change. It’s likely that such a tax would also deter the sort of irresponsible speculation that led to the current crisis. 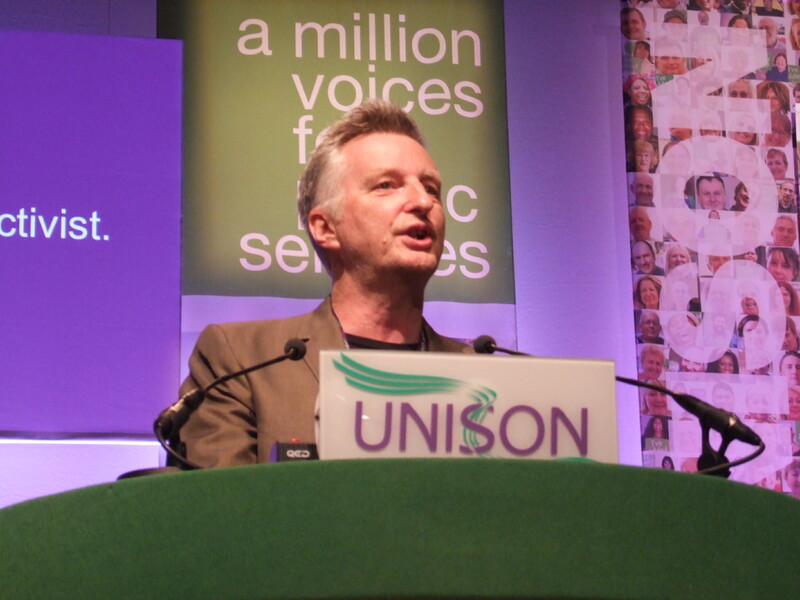 This was the first UNISON conference since the fall of the Labour Government and a hastily bandaged together alliance of the Conservatives and the Liberal Democrats (to be known for ever as the Con-Dems) taking over the reigns in Downing Street. Whilst coalitions are common, in fact the norm, in many countries, we are not used to this sort of thing in dear old blighty. It is a subject that has generated a lot of thought in recent months. Apathy seems to be the order of the day, with many believing that there is little difference between any of the major parties. The resultant low turnouts have meant that fringe parties have benefited. Billy looks forward to the day when everyone’s vote counts. “When people don’t vote, we are in big trouble”, he began, “and at the moment huge numbers of people are staying away from the polling stations. Huge sections of society are feeling disenfranchised. We also have the scary situation of former labour voters voting for the BNP”. In the run up to the election Billy had encourage people to vote tactically, stating; “At the coming election I will be voting the same way that I always have – against the Tories”. The election of a Con-Dem coalition has thrown a spanner in the works though, a vote for the Lib Dems effectively helped put the Tories back in power. “It is a sad state of affairs”, Billy told us, “I want to vote positively, for a party that I want, rather than negatively, to keep the Tories out. I feel very cheated by the Lib Dems. What we need is a referendum on a more democratic voting system, we need to make Parliament more democratic and we need to make the House of Lords more democratic.” (Shortly after we had this chat, the Government announced a referendum on the Alternative Vote system. We don’t think this was what Billy had in mind – it is not even what the Lib Dem’s or Conservative party want, but a half arsed compromise). Billy has long been an outspoken opponent of racism, fascism, sexism, homophobia and every other form of discrimination. He is also an enthusiastic supporter of multi-culturism. He recently published a book, ‘The Progressive Patriot’, which looks at what it means to be patriotic and pulls the rug from under the feet of those that think patriotism means being against people with a different background. Billy confronts Richard Barnbrook, BNP candidate for Barking and Dagenham. Billy first got involved in music because of racism; he went to see the Clash at a Rock Against Racism (RAR) gig in London’s Victoria Park in 1978. RAR had been set up in 1976 as a response to the rise of the National Front and the far right. It had been an idea kicked around by a few friends, including Roger Huddle (who, in a symbiotic twist of fate, went on to be communications officer with UNISON) but became a reality after a drunken declaration by Eric Clapton in which he expressed support for right wing MP Enoch Powel who had made a controversial speech, known forever as the ‘Rivers of Blood’ speech. “Clapton’s speech was all the more disgusting” Roger Huddle wrote in a recent article, “because he had his first hit with a cover of reggae star Bob Marley’s ‘I Shot the Sheriff’. In reply we wrote a letter to the New Musical Express and signed it, along with two members of Kartoon Klowns”. 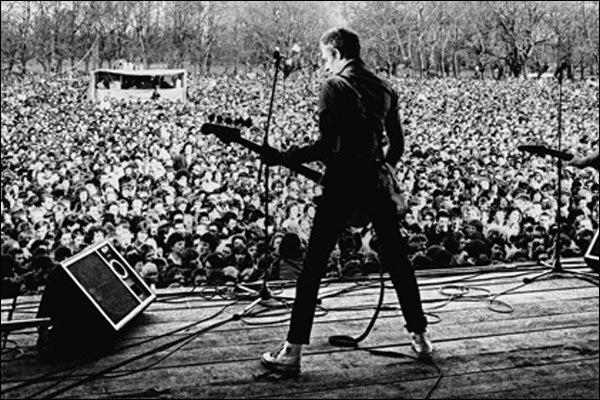 Then, on the 30th April 1978, RAR put on a massive gig in London’s Victoria Park featuring the Clash, X-Ray Spex, the Tom Robinson Band, Steel Pulse and Patrick Fitzgerald. “I marched to the park”, Billy Recalls, “and there were 100,000 kids like me. I realised this would be our Vietnam; I knew I was not in the minority, there were lots of people that thought like me. But it was the audience that changed peoples perspective, not the Clash themselves. Only people can change the world”. “Times have moved on since then”, Billy continued, “but people like the BNP and the EDL are just using the same strategies as the old National front. We still need to confront them at all levels, campaign and organise opposition. Love Music hate Racism has picked up the baton where RAR left off and is continuing in the same fine tradition”. Back in those heady days of punk and through the Thatcher’s 80’s political music was not confined to the fringes, but was on the front line, forging the way forward into the future. Rebellion and DIY was at the heart of the punk and post punk movement. “The music scene is different now, compared to when I started out”, reflects Billy, contemplating the current situation. “Many young bands started making political music around the time of the Miners Strike. At that time the people running the music press were often the children of the revolutions of 1968, and were naturally sympathetic” We cant help agreeing, back in the day the NME was more left wing than anything you will find on the newsstands today. Today it is part of the establishment, the old ‘alternative’ and ‘indie’, have now become the mainstream and its cover stars are just as likely to be found on the front of the Guardian, performing on the Culture Show or even having tea at Number Ten. “These days it is different”, Billy continues, “you can’t do things in a vacuum, so we need young bands need to step up to the mark. Music made me political, there is no reason why it cannot make the next generation political”. deliver guitars to Wormwood Scubs prison. “It has been going for four years now”, Billy states proudly, “and we have helped people from 35 prisons and there is now a sister project in America”. The American wing of the project is run by Wayne Kramer of the MC5, the subject of the original song, following his stint behind bars for possession of cocaine. “It has been hard work”, Billy continued, “Some prisons have been very reluctant to let us in with steel strung instruments. It has paid off though, three of the guys we worked with have gone on to start their own project and have won a Prince’s Trust award”. “Others have used the project to help them to learn to read and write. Two of the ‘graduates’, have recorded albums and are touring the UK making an honest living for themselves, including playing on the Leftfield stage in Glastonbury Festival”. 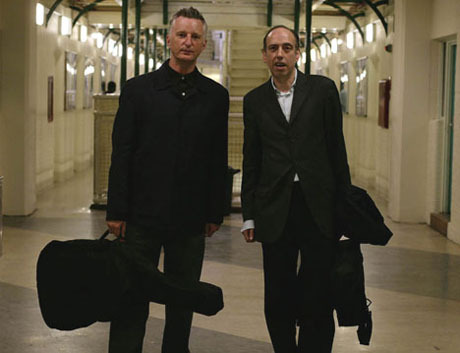 The two graduates he refers to, Jonny Neesom and Leon Walker, have also toured the country, performing short sets and doing Q&A sessions, accompanying showings of the film ‘Breaking Rocks’, which tells the story of the jail Guitar Doors project and features a version of Jail Guitar Doors being performed by Walker, Kevin and Smiley – two other graduates – plus Bragg and original Clash dudes, Mick Jones and Topper Headon. He may be mainstream enough to be invited to speak to union conferences and appear on Question Time these days, but he clearly has not forgotten his roots. Over thirty years on from that RAR gig in London, its affects can still be felt, Billy is still fighting the good fight and inspiring others the way the Clash inspired him. Long may he continue to be ‘The Milkman of Human Kindness’.